Ahoy Matey! Pirate party favors are unique, will add to your decor, and are sure to be a hit at your pirate party. Pirate party favors are also great for a monster birthday party or sugar skull party! 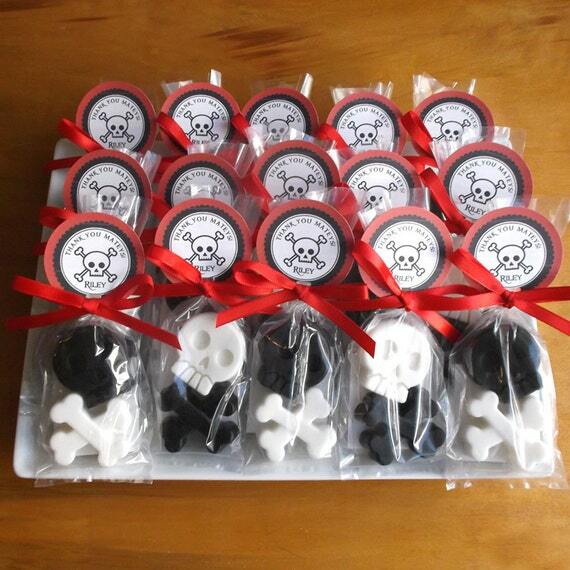 Each pirate party favor includes a skull soap and a crossbones soap. Set of 10 pirate party favors. Each order comes with 10 soap favors (20 soaps in total, 2 per bag). Soap measures approximately 1.75" x 1.5"
Packaged in a cellophane bag with a ribbon and "DO NOT EAT" tag. This is our most popular option! All soaps are packaged in a cellophane bag with a fabric ribbon, "DO NOT EAT" tag and personalized favor tag. With this option, your soap favors come to you assembled and ready to give your guests upon delivery. This option is perfect for a low budget! With this option all soaps are wrapped in a cellophane bag with a "DO NOT EAT" tag and fastened with curly ribbon. You can remove the curly ribbon and replace it with your own fabric ribbon. Tags are NOT included. Ingredients: Glycerin (kosher, of vegetable origin), Coconut Oil, Palm Oil, Safflower Oil, Purified Water, Sodium Hydroxide (saponifying agent), Sorbitol (moisturizer), Sorbitan oleate (emulsifier), Soy bean protein (conditioner), Scent, Titanium Dioxide, Color/Iron Oxide/Mica. May contain FD&C/D&C colorants.